The autumn weather can be unpredictable. 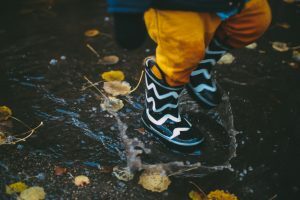 When storms come to visit, they often lead to messy runoff that carries away your garden’s dirt and form large puddles in the most inconvenient places. But where does all that water go once the storm passes? This water, known as stormwater, often runs into storm drains that lead directly into the nearest streams with little to no filtration. Along the way, it picks up chemicals and oils from the street, plastic and other litter, and all the dirt that was washed from the garden along with whatever fertilizers and chemicals it contains. These pollutants end up in the local waterways, contributing to issues such as increased sedimentation and water pollution right in our own neighborhoods. Today we’re going to talk about stormwater and how gardening can play an important role in helping to support water quality. According to the EPA, stormwater is runoff generated from rain or snowmelt that flows over land or impervious surfaces (such as paved streets, parking lots, and building rooftops) and does not soak into the ground. As water travels over these surfaces, it picks up pollutants such as trash, chemicals, oils, and sediment that then make their way into waterways, often causing harm to the larger bodies of water into which they flow. As the global population continues to grow, development and urbanization increase the amount of impervious surfaces, contributing to an increased volume and rate of run off. These changes in hydrology result in habitat modification and loss, increased risk of flooding, decreased aquatic biological diversity, and increased sedimentation and erosion. So how can Extension Master Gardeners make a positive impact on stormwater? With the help of some Master Naturalists, we’re going to explore the idea of buffer landscaping. Buffer landscaping is the maintenance of vegetation along a waterfront. These plants create a buffer which acts as a filter for stormwater and other runoff, catching sediment, debris, and pollutants before they can enter the waterway. Buffer landscaping also helps prevent bank erosion because the roots of the plants hold the soil and prevent it from being washed away. This increases water clarity and protects aquatic and terrestrial habitats by preventing sediment from being swept into the waterway. Having plants near the water also provides shade, helping keep water temperatures cooler and improving habitat for fish, amphibians, and other aquatic life. You don’t have to live alongside a waterfront to plant a garden that performs valuable water filtration services. Consider creating a rain garden to help prevent stormwater runoff in your own neighborhood. Rain gardens contain plants that can survive soil soaked in water from rainstorms, although they are not meant to remain in standing water indefinitely. These gardens collect and slow stormwater runoff, allowing it to filter through the soil and preventing it from running straight into storm drains, carrying sediment and pollutants with it. When choosing plants for your rain garden or buffer landscaping, there are a few important characteristics to keep in mind. Native plants are best adapted for local climate conditions and provide important habitat cover for native wildlife. As an added bonus, choose plants that are pollinator friendly to encourage pollinators to visit your garden. Deep roots ensure that your plants won’t be washed away during heavy rainfall and plants that prefer wet soil are sure to thrive in areas often inundated with water. For a list of recommended plant species for riparian buffers and other landscaping in Bedford, Franklin, Pittsylvania, and Roanoke counties, visit the Smith Mountain Lake Association’s Buffer Landscaping Web Page here. For a comprehensive guide to installing a rain garden, visit the Department of Forestry’s Rain Garden Technical guide here. Interested in learning more about stormwater management? Check out these additional resources from the Virginia Cooperative Extension!